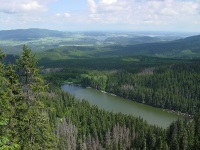 Sumava National Park is one of the Czech Republic's dearest treasures. Located in two southern regions, the area has nurtured Europe's wildlife since the earliest days. Visitors tend to feel this history. The striking landscape features wise, low mountains, rushing streams, peat bogs, and crystal-clear glacial lakes, all of which delight the eyes and nourish the spirit. Hikers and bikers can expect a wonderful selection of trails. Indeed, some of these paths may well have served ancient Celts, who lived, and fought, and loved one another within the forest's borders. The park's resorts are a favourite among skiers during winter, while Lake Lipno is a summer haven for water sports. Spring is popular with nature lovers, as it is perhaps the best time to see the park's array of flowers and birds. Autumn, on the other hand, is spectacularly colourful. Visitors can choose a hotel or cottage in the park itself, or stay in one of the historic towns on its edge. These include Prachatice, Cesky Krumlov, and Kasperske Hory.